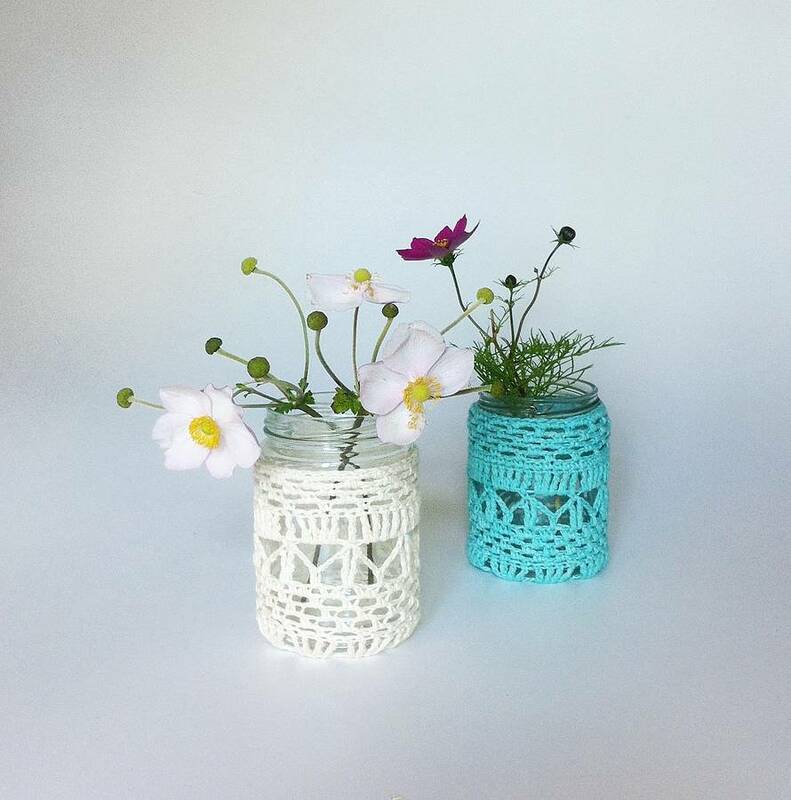 Upcycle your jam jars into pretty vases and candle lanterns with these lovely handmade organic cotton holders for some handmade charm around your home. 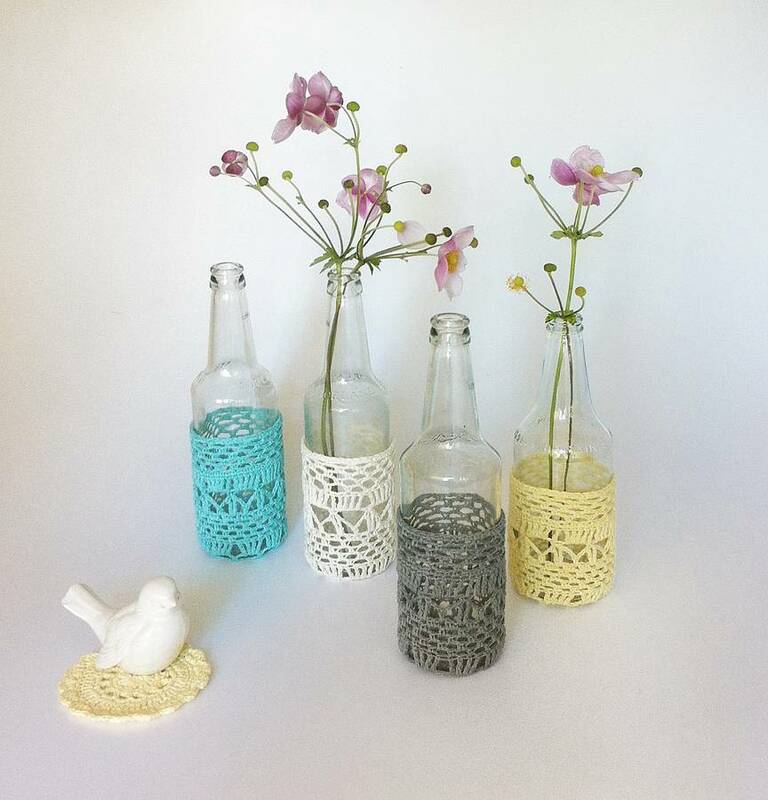 Sold inclusive of your choice of jar or bottle. 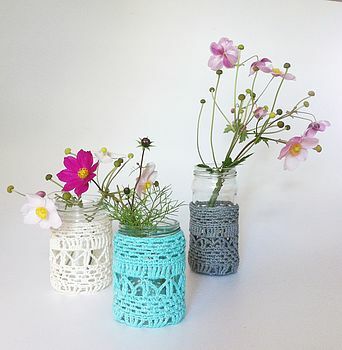 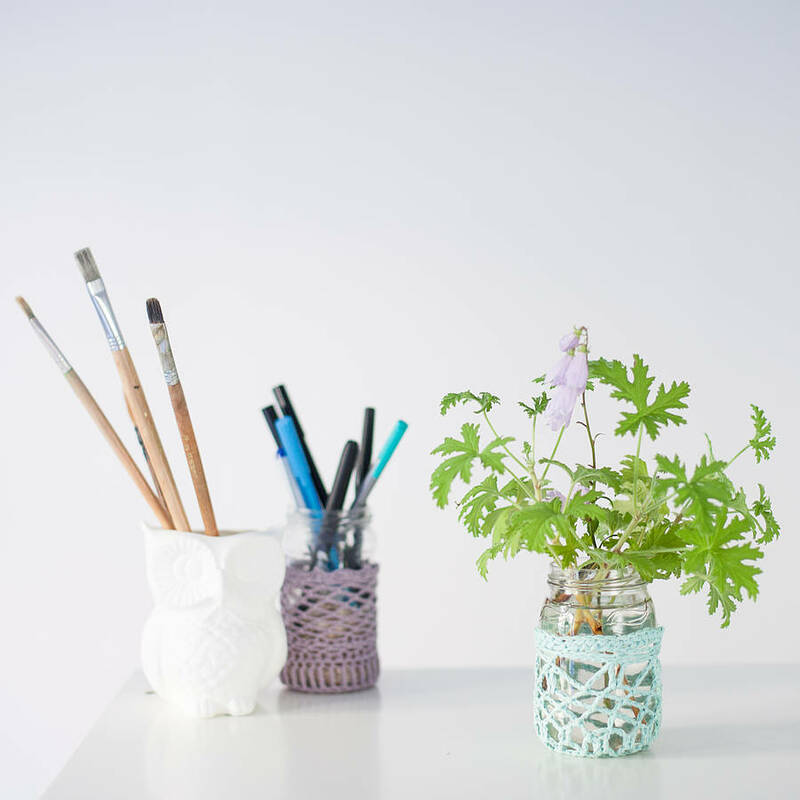 Wild posies look perfect housed in these upcycled jars and bottles covered in freehand crochet. 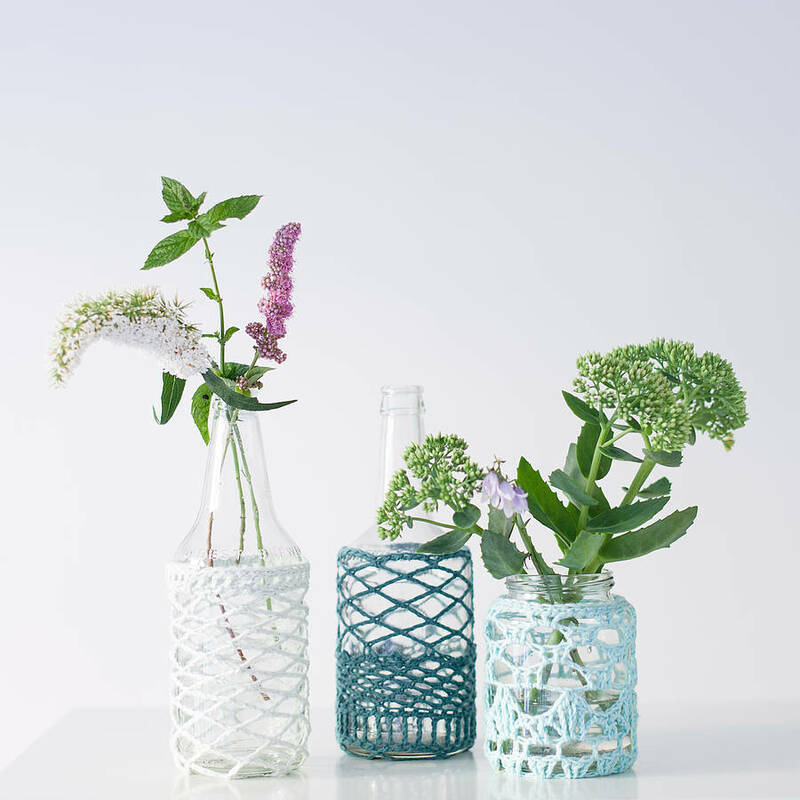 Perfect for lighting up any space, outside or in, these vases give your flower displays a lovely hand made country feel. 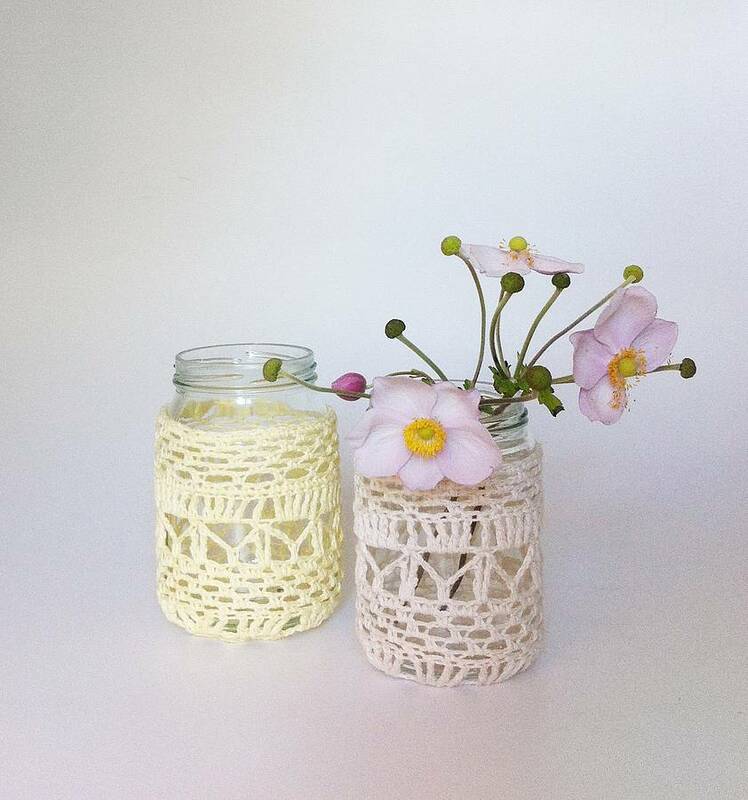 The jars are perfect for holding tea lights too, the diffused light twinkles through the lace and creates a beautiful pattern on the surface it stands on, very ambient. 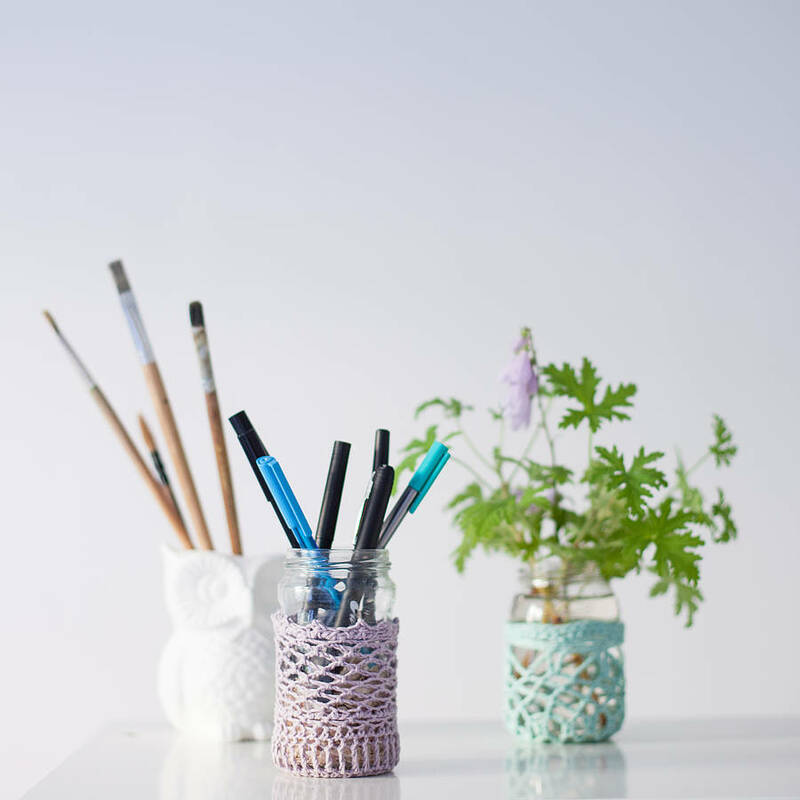 Hand made using organic cotton and recycled glass items, they can be washed and used for whatever purpose you choose, tea light holders for a wedding, vases for the home and for dressing tables, paintbrush and pen containers for your desk or studio, the uses are endless. 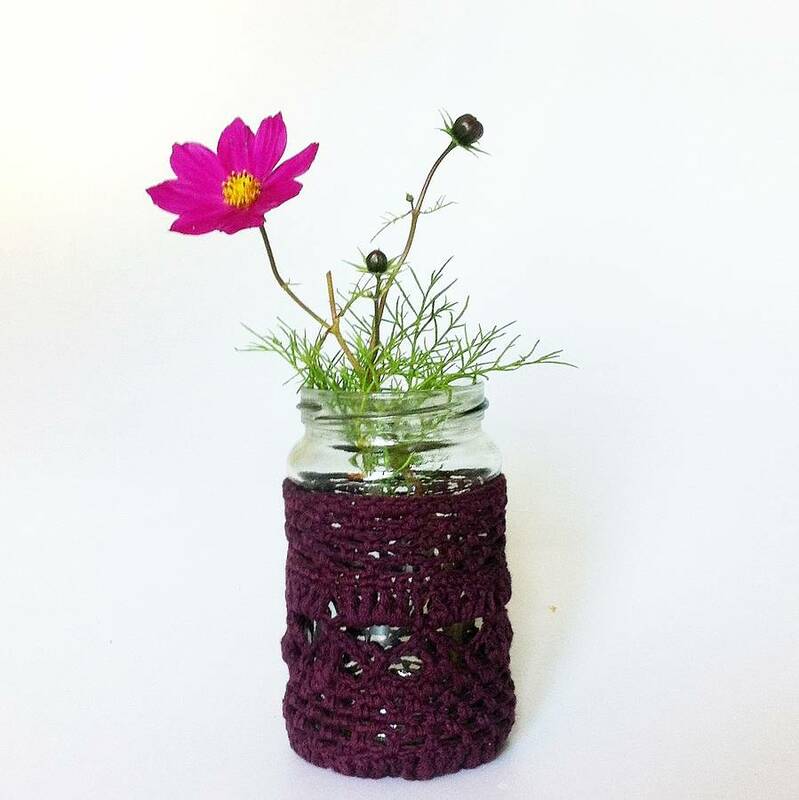 The charm of these is that each one is unique, made using free hand crochet to cover recycled jars, the item photographs are an idea of each style available. 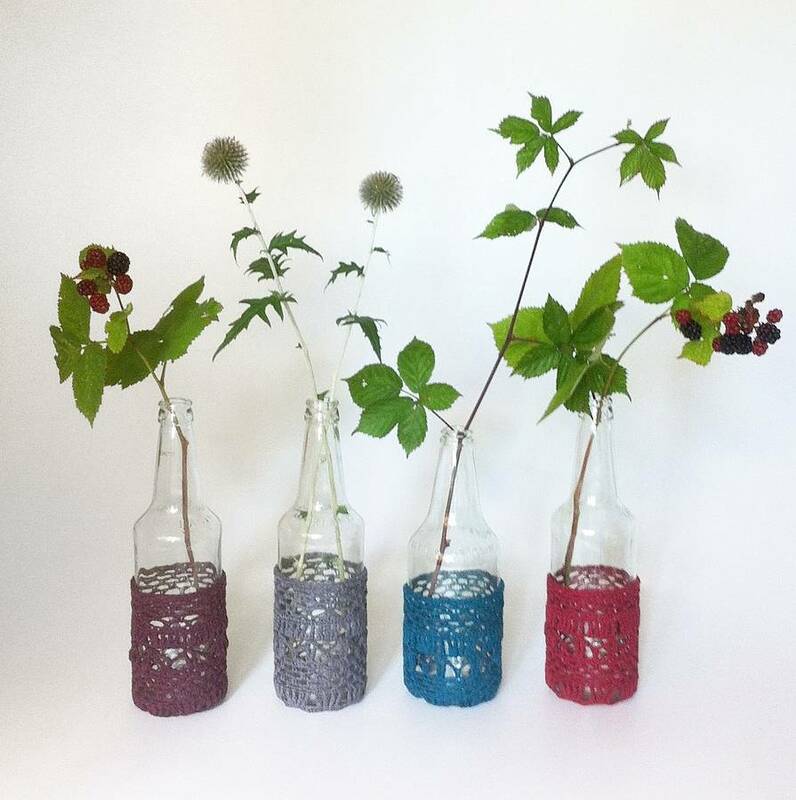 Available in the following colours- Cream, Pale Yellow, Lilac, Turquoise, Teal, Light Grey, Dark Grey, Aubergine and Wine Red. 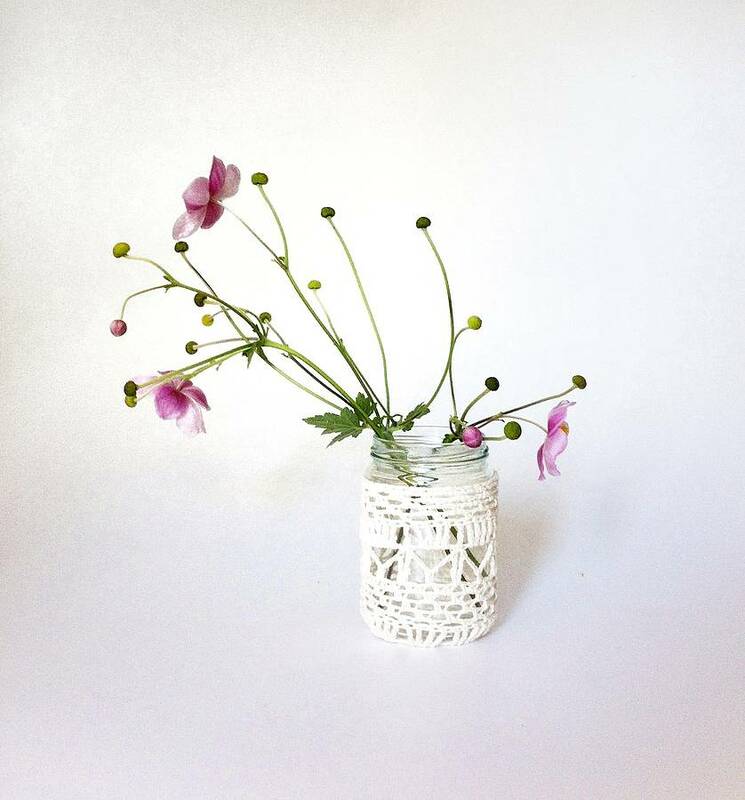 We can also do bespoke orders for weddings and other occations, please write to us with what colours and sizes you might need. 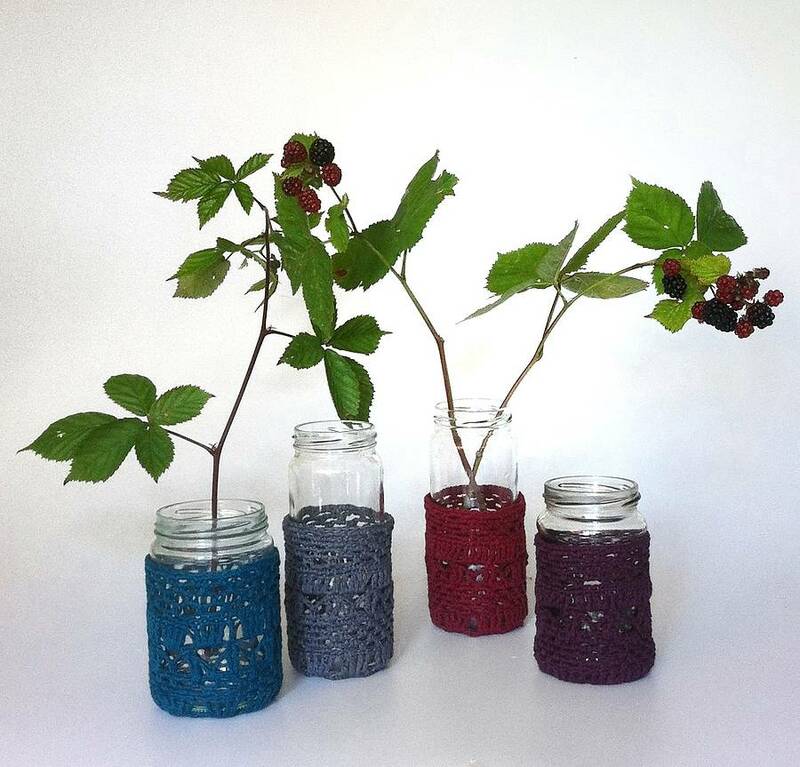 100% Organic Cotton and recycled jam jars and bottles. 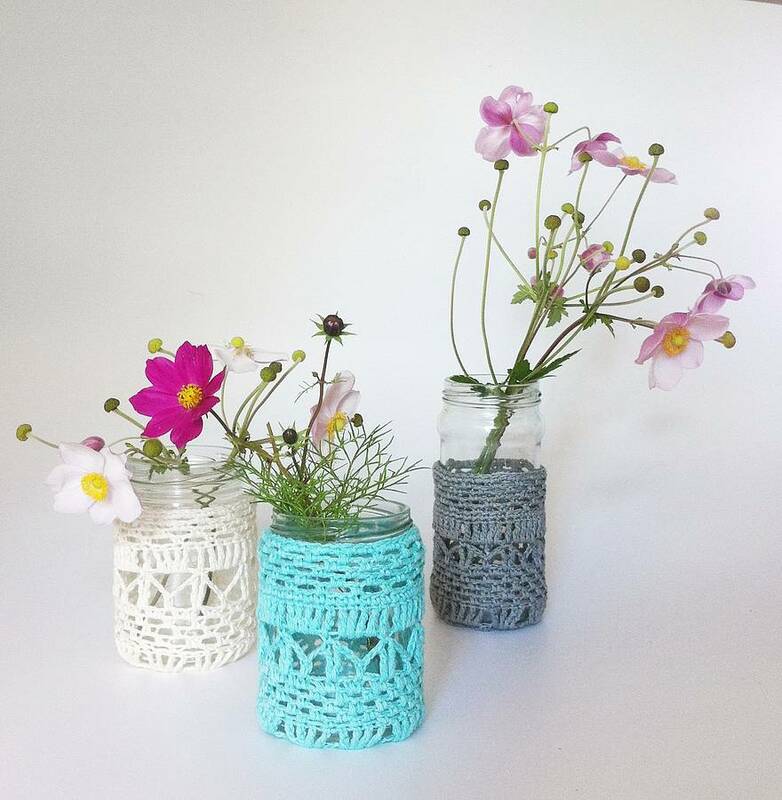 Usual jam jar size of around 15cm x 6cm Bottles of about 25cm in height and 8cm in width, but they are all collected and recycled so the sizes vary, if you have a request for a jar size, or for more than one to be of similar shape/size, please make a note when you order.